There is something fascinating about watching an animal behavior that we don't normally witness. After two Peregrine Falcons forced this Great Horned Owl down into Lake Michigan, the owl managed to escape with a few strokes of butterfly. Birder and photographer Steve Spitzer captured this video at Loyola Park Beach in Chicago after he and his fellow birders scared the falcons away. Someone called bird rescue to lend the owl a helping wing, but it flew off before rescue arrived—after doing a bit of swimming, using its wings as paddles to propel itself forward. 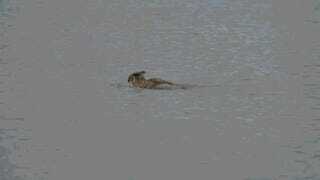 I think we may have to rename the "butterfly" stroke the "Great Horned Owl" stroke. This apparently isn't a singular event. Other folks have witnessed Great Horned Owls swimming on occasion, sometimes to great surprise of wildlife professionals. Here we're fortunate that Spitzer got the video for posterity.